Are you ready for “Redfox Lure Party” this weekend? 1. 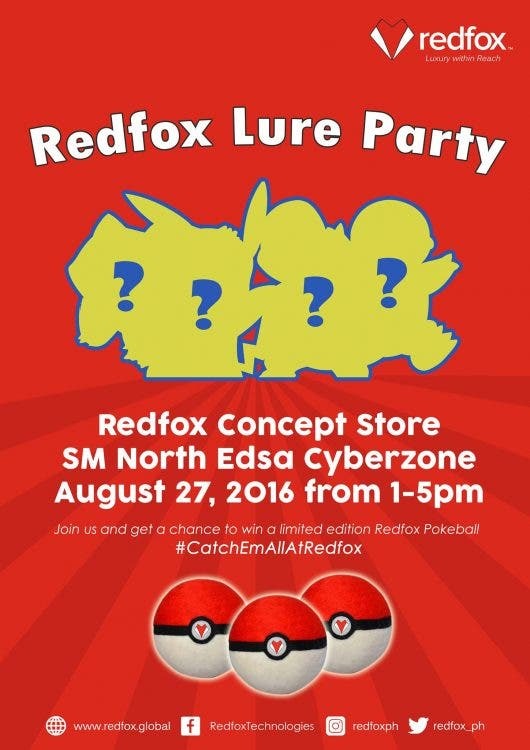 Redfox Lure Party is open to all Pokemon Hunters who will visit Redfox Concept Store, SM North Edsa Cyberzone on August 27, 2016 from 1pm-5pm. 3. Tag our official Facebook page Redfox Technologies with the official hashtag #CatchEmAllatRedfox and #LuxuryWithinReach. 4. Once posted get an instant limited edition Redfox Pokeball. 5. This is valid for one player per account only.